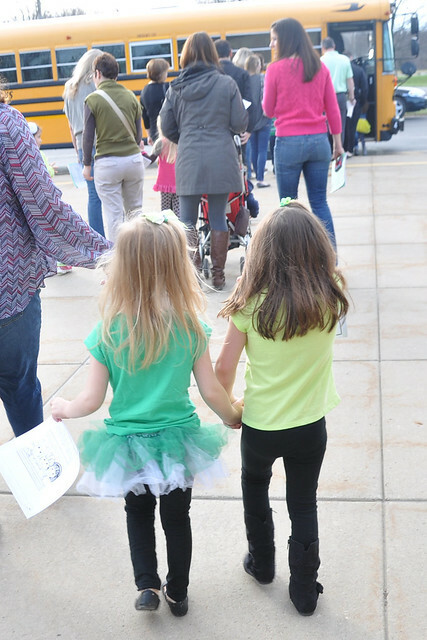 Redshirting Kindergarten (AKA holding eligible kids back an extra year) is becoming a popular trend. It's certainly common where we live! Lily will turn 5 just a few weeks before the school year begins. She is eligible according to her age, but only by a few weeks. After doing a lot of research, and speaking with many friends and educators, we have decided to send her to Kindergarten in the Fall. What this means is that she will be one of the youngest kids in her class. Most of her classmates already turned 5 and she will be starting Kindergarten with quite a few kids who are already 6. Some of her preschool classmates, who also have summer birthdays, will be attending another year of preschool. When we tell people what we decided, it is usually met with surprise. Our decision goes completely against what is popular in our area. I definitely understand why some parents choose to do it. 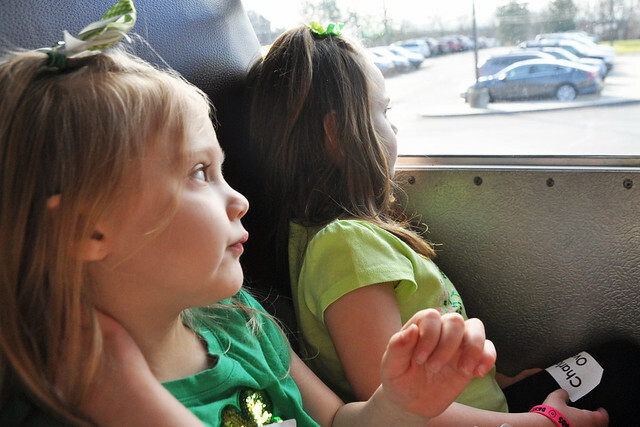 Some children just aren't ready to start Kindergarten, even if they are age eligible. But I feel like it's becoming more of a trend to automatically hold a child back if they have a summer birthday, instead of considering the child in question. I spoke to people who chose to redshirt their child and people who chose to send their young child. I spoke to educators that believed in redshirting and educators who didn't notice much of a difference in many cases. Even after speaking with people regarding their decisions and experiences, we still had to consider WHO Lily was and factor her into the equation. 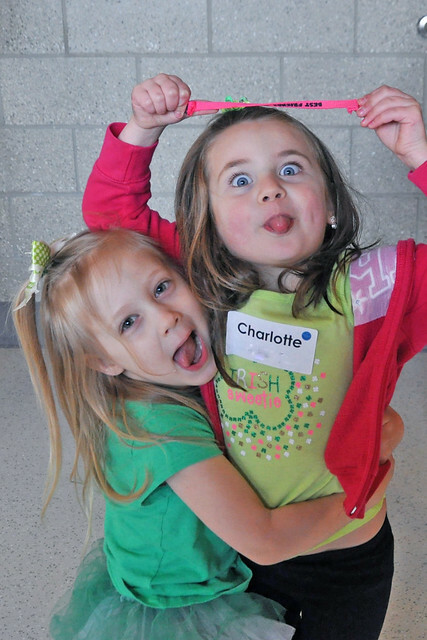 Kids of all ages and abilities have their own set of strengths and weaknesses. A child who will be one of the youngest in the grade can quite possibly be more prepared for Kindergarten than a child who is older. I witnessed that during Lily's Kindergarten preview. We truly believe Lily is ready. She has fantastic social skills and she's very independent. She listens well, respects those in charge, follows directions, and aims to please. Lily has two older siblings to learn from, and I think that does make a difference. She is also a big sister to a sibling who has special needs, and with that comes more responsibility early on. Lily turned 2 just days before Liam was born. She was still practically a baby herself. With Liam's birth diagnosis, we were immediately thrown into multiple medical appointments with specialists, a hospital stay, and the start of welcoming therapists into our home each week. My husband and I work so hard and spend so much time making sure each of our kids gets an abundance of love and attention. Even so, Lily had to learn at a very young age that she had to share her mom with her baby brother. Liam's therapists have always been so wonderful at including Lily in Liam's therapy sessions and making her feel important. When Liam walks on a balance beam, Lily walks on a balance beam. After Liam finishes a peg board or a puzzle or flash cards, Lily gets to use them. She always sits at Liam's Speech Therapist's side, and basic signing is now part of her lifestyle. Although those sessions benefit Liam the most, they have also been an incredible learning experience for Lily. What Lily also learned from the experience of having therapists in our home three times a week, was how to play independently and learn how to problem solve when I couldn't immediately help her. It encouraged her to try to do things by herself, which only spurred her independence. Her favorite phrase at age 2 was "Lily do it!" The result of that is a 4 1/2 year old who is more independent than many kids who are much older than her. She is able to meet all of her basic needs, and recently, we started to notice a big change in her maturity level. She cleans up her room without being asked. She even cleans up Liam's toys, which are always scattered through our house, just to be helpful. A few weeks ago, she pulled a stool up to the kitchen counter, dried all the dishes, and put away all the utensils. It was completely on her own, and ever since, she took it upon herself to do that each night. She is always asking if we need help! Socially, she's ready, too. 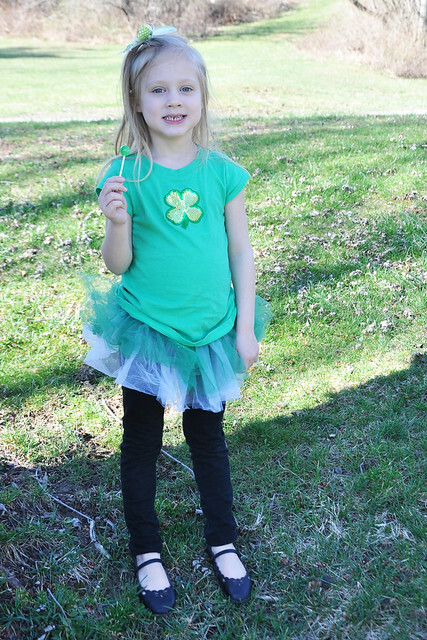 Lily is the kind of kid who can walk up to any child and immediately become their friend. She's disappointed if we go to the park or the library and nobody else is there. She's not afraid to be away from me. She is very empathetic, loving and mature for her age. She thrives in a social environment, and she loves to be around her friends. 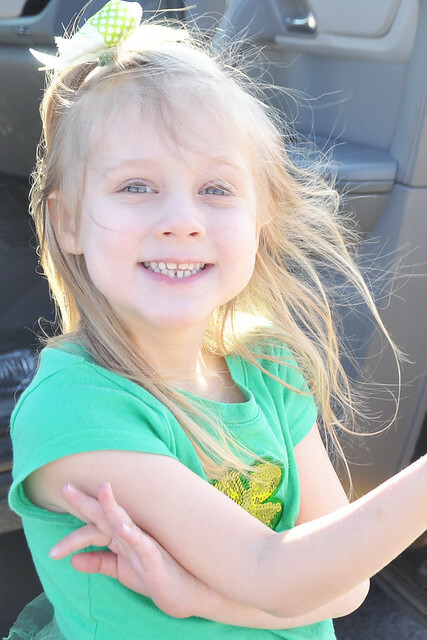 There are absolutely no worries when it comes to her social skills or her independence. She loves going to school and all she talks about is starting Kindergarten. The only (slight) concern I ever had was would she be ready academically? Would she fall behind? Lily will only have 1 year of preschool under her belt when she starts Kindergarten, compared to some kids coming in with 2-4 years of preschool. When I saw her progress report halfway through the school year, she was progressing very well. There really wasn't any cause for concern academically, which pushed me to seriously consider sending her to Kindergarten as planned. That being said, we are going to focus on a lot of flashcards and math games over the next few months to give her an edge over her classmates who will be quite a bit older than her. In the end, what it all came down to was this: Nothing is permanent. We can always give it a shot and reassess at the end of the year. Whether she's in a preschool classroom or a Kindergarten classroom, she will still be learning. We will assess her strengths and weaknesses and brainstorm ways that we could help her strengthen those weaknesses. It's always important to reassess at the end of the year for ANY child. It's what we do for Dylan and Lexie, and it's what we will do for Lily and Liam. Parenting really is a full time job, and one of those responsibilities is staying actively involved in our child's education and making decisions that we feel are right for our child. We did our research, we weighed the pros and cons, we considered the what-if's, and we made our decision. 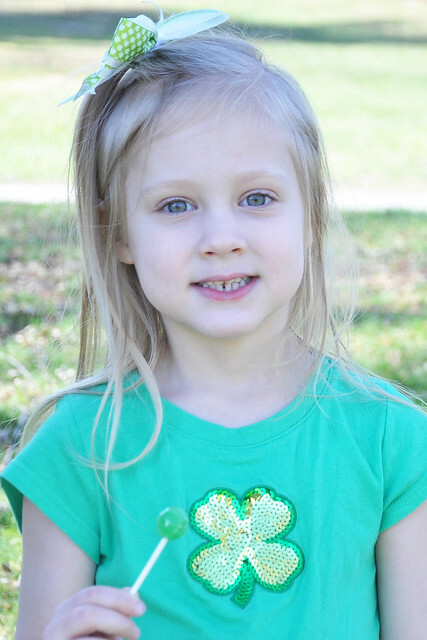 Going to Kindergarten, even as a very young five year old, is the right choice for Lily. I have no doubt she will thrive! 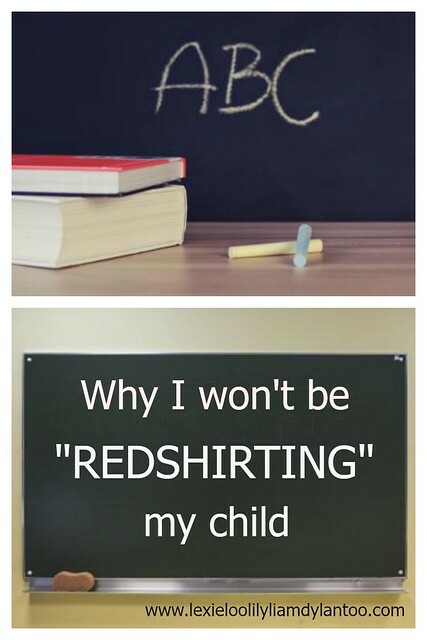 Did you "redshirt" any of your children or are you planning on holding them back? Or did you do the opposite and send your child even if they were younger than most of their classmates? We already completed Step One in the Kindergarten process! 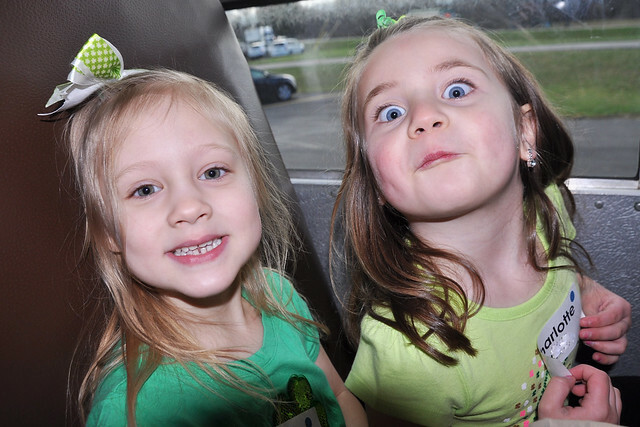 On St. Patrick's Day, we headed to the primary center for Kindergarten preview. Lily was so excited to go to Kindergarten! She was even more excited when she saw her best friend walking toward her. They were conveniently placed in the same preview group! 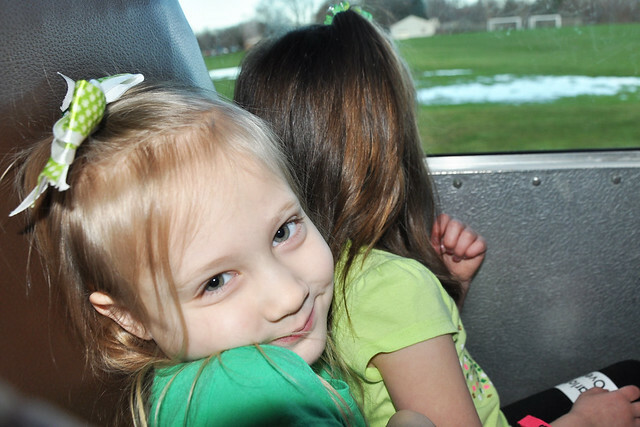 First up, was the most exciting part: a bus ride! Next, she made a craft, then toured the school on a scavenger hunt while I listened to the same Kindergarten introduction speech that I heard two times before. The preview wrapped up with a storytime session in the library with the school librarian. Each child got to introduce themselves and their siblings. Lily had no trouble mentioning Dylan and Lexie, but forgot all about poor Liam! While she listened to the story, I signed her up for her Kindergarten assessment and picked up her registration packet! It's getting real! Lily loved spending time at her future school. After we left, she asked if she could come back the next day! She's all ready to go! I am so glad you wrote this. I need to save it in my "files" because I'm struggling with this. Cam will be 4 on July 17th and I'm so torn as to whether we will send him to Kindergarten after preschool next year or wait a year. I go back and forth. As a teacher I'm struggling too. I've decided (and talking to my hubby) that we need to take it one step at a time. I'll mention our thoughts once he starts in the 4 year old class this fall and see how things go throughout the year. I love hearing your perspective. Stella turned five at the end of May. 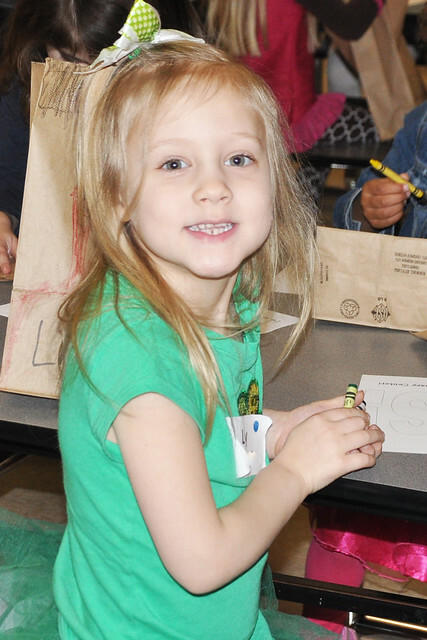 We homeschooled for preschool and at Kindergarten registration, the teacher said, although she was eligible by age, maybe we should consider keeping her out an extra year and send her to a "traditional" preschool. In the end, it was our decision to make. I'm happy to say. we sent her and she is thriving in kindergarten! She loves school! We waited for my older son. His birthday is July 31st. He was in speech and was still difficult to understand at times so that was one of the reasons we decided to wait. We wanted to give him more time to improve his speech. I also felt he needed another year of shorter preschool days before starting full day kindergarten as he is more of a home body and he prefers to be with me. I totally agree that it depends on each individual child. We started preschool with him at three with the intentions of seeing how he was at five and deciding then. Three years of preschool was best for him. It sounds like you made a great decision! Liam also has a birthday just days before the cutoff. Due to his special needs and the fact that he's so much smaller than his typical peers, I'm thinking we will redshirt him. It definitely depends on the child! Sounds like a good plan to me. K turned five 2 weeks before school started and I didn't hesitate once to send her and good thing I did because she's done great. I had a lot of people asking me if I was going to send her and I thought that was a strange thing to even ask, but I guess times have changed. My daughter's birthday is August 27th and my son's is September 29th. Both started kindergarten at 4 (almost 5) years old. Now they are 12 (7th grade) and 9 (4th grade). We've never had any social or academic concerns with either kid. With my son, for whom we had to get special permission to enroll since he is after our district's September 1st cut off date, I was more concerned about him becoming bored in another year of preschool and the effect that could have on his future attitude toward school in general. I can tell you from experience that you know best if your child is ready and Lily will do great in kindergarten. Thank you so much for your input! I'm glad to hear that it went well for your kids! We will not be redshirting Jacob either. His birthday is 7/23 so he will barely be five this fall for kindergarten, but we feel that he is completely and totally ready. He is already reading full books, he loves to learn, and he is very social and plays well with others. If we held him back, he would be totally bored because he's already so advanced for his age, and you know what happens when kids get bored... they get in trouble. Well...we're in this together then! It definitely sounds like he's ready! P.S. I love your new blog design... it looks really great! Thank you so much! It has been on my to do list for a long time. I just had to find a few hours to sit down and work on it. It's a work in progress, but I really do like it so far! Karsyn doesn't turn 5 until July either. We're enrolling her in Kindergarten this fall and I know she'll do great. Being on the other side of this issue (Evan advanced from 3rd grade to 5th grade) and being a preschool teacher, I would highly advise that the decision to red shirt be made on a child by child basis. We are seeing some parents make the decision when there really isn't a need to hold their child back. It's not even limited to the child having a summer birthday. That is exactly what seems to be happening here. For some cases, yes, I can see why it's done. But I think it's kind of like a herd effect, know what I mean? I know she's ready for this! Our cutoff is September 1st (or maybe August 30th or 31st). I know in some states, it isn't until the end of the year. I'm guessing it's a later cutoff where you live! 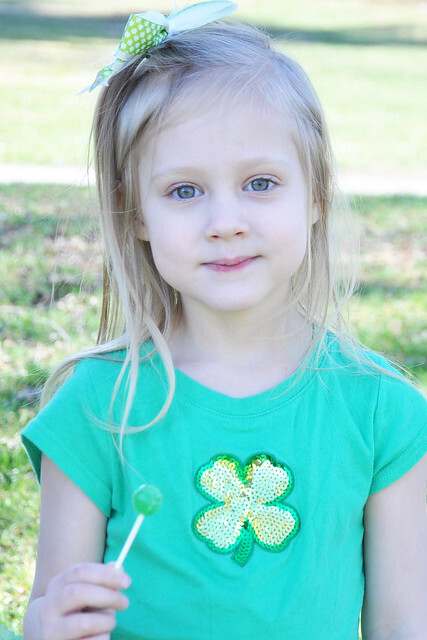 Samantha was one of the 3 youngest in kindergarten and did just fine. She is now in 6th grand and doing awesome. I can not imagine having her only be in 5th grade now. Thank you for sharing your experience! I'm glad to hear that it went well! Someone always has to be the youngest, right?!? We didn't wait either. Marissa has a June birthday and we pushed her on and she has excelled beyond all expectations. Just think they'll get to graduate when they are just 17 too! That's because she has an awesome mama! XOXO Thank you for sharing! I know Lily is ready for this! I wasn't redshirted. My birthday is during the beginning of August and my parents started me right after I turned 5. It was awesome to graduate at 17, but I was one of the last to drive in my grade. My husband was the youngest in his class, too. He said that was the ONLY downfall! Oh man. I needed this today. It seems as though everyone has an opinion about this. We plan on sending Henry in the fall. He'll be five in May. I wish Kindergarten was a half day, but for the most part, I think he'll be fine. I can't believe it's that time. Time to let go. Time for him to be away from me all day. Boy, this is going to be hard. This blog post helped, though. Thanks for the motivation and confidence!